26 tickets left! Available For 35 More Days! 22 tickets left! Available For 35 More Days! Prepare yourself for an evening of fun and friendly competition against fellow upstate attorneys. 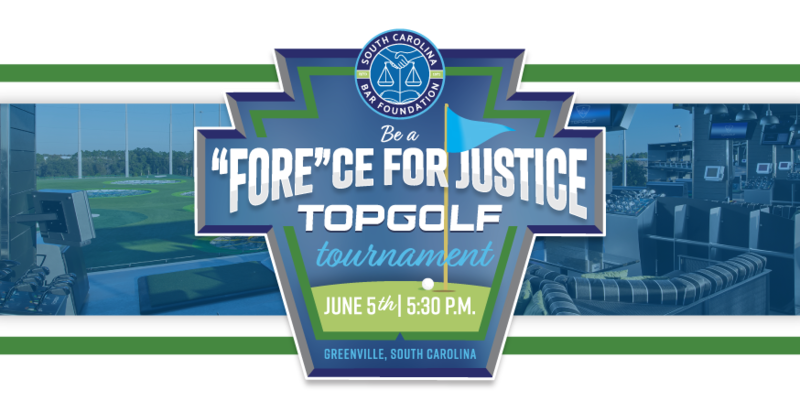 Enjoy food and beverages, networking, and maybe some harmless trash talk at our Be a "Fore"ce for Justice Topgolf® Tournament, June 5th, 2019 beginning at 5:30 p.m. at Topgolf Greenville. Topgolf is a global sports entertainment community creating the best times of your life. With golf balls that score themselves and exciting games for all ages and skill levels, Topgolf is the ultimate venue for fun. Topgolf Greenville also features climate-controlled hitting bays, music and an impressive food and beverage menu. We'd be honored to partner with you for this event. Please contact Melissa Spivey for full details about sponsoring this event.